A delightful return to the romantic-comedy territory that Woody Allen last explored in such classics as "Annie Hall" and "Manhattan," "Alice" was also Oscar®-nominated for Best Original Screenplay, but departs from the earlier films in its embrace of out-and-out fantasy to the point where it becomes a contemporary fairytale. 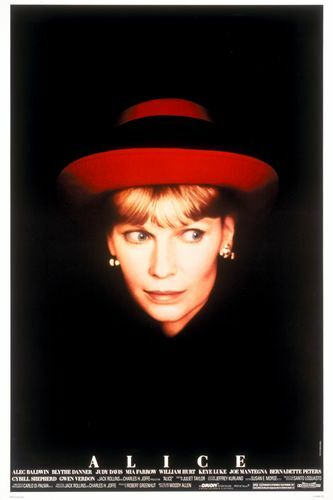 Alice Tate (Mia Farrow, "Hannah and Her Sisters") is trapped in a loveless marriage to Doug (William Hurt "Gorky Park"), to the point where a chance encounter with handsome jazz musician Joe (Joe Mantegna, "Body of Evidence") leaves her hopelessly conflicted. Seeking treatment for backache from a Chinese acupuncturist (Keye Luke, "Phantom of Chinatown"), she confesses her feelings under hypnosis and comes away with some ancient herbs that possess mysterious and even supernatural powers. But will they solve Alice’s dilemmas, or merely make them even more complicated? And can she really throw away all Doug’s material wealth purely for love? Gliding effortlessly from reality to daydream and from memory to magic, while exploring the intricate and unfathomable unity of human bonds, "Alice" was described by the New York Times as “hilarious and romantic, serious and exuberantly satiric”.